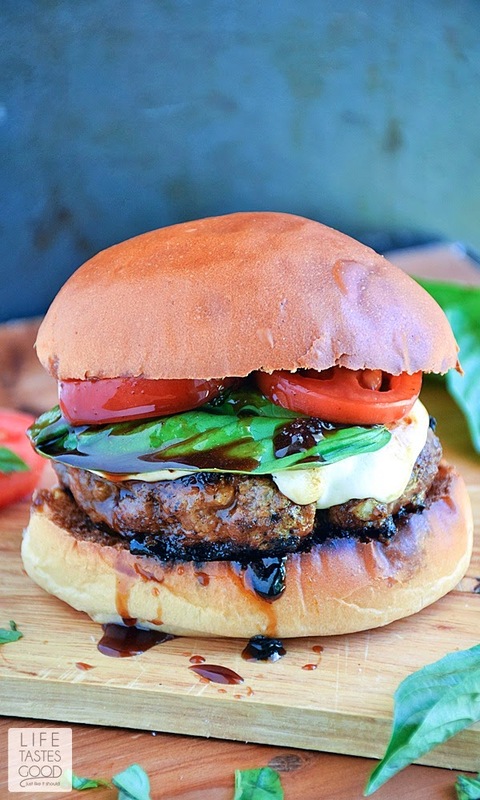 Balsamic Burgers are grilled to juicy perfection while basting with a sweet and tangy balsamic glaze, and topped with tasty tomatoes, fresh basil leaves, as well as creamy mozzarella cheese for an Italian inspired burger I could eat every day! This post is sponsored by the Certified Angus Beef® brand in conjunction with a social media campaign through Sunday Supper LLC. All opinions are my own. Happy Father's Day! Our #SundaySupper family has partnered with the Certified Angus Beef® brand to share summertime grilling recipes this week. Be sure to visit each of the #SundaySupper websites for more tasty recipes, and follow the Certified Angus Beef® brand Summer Grilling Pinterest board. You are sure to find something tasty to make Dad's day even more special! I may have mentioned once or twice my favorite recipes are the simple ones using fresh, quality ingredients. That is why I love this burger recipe so much! 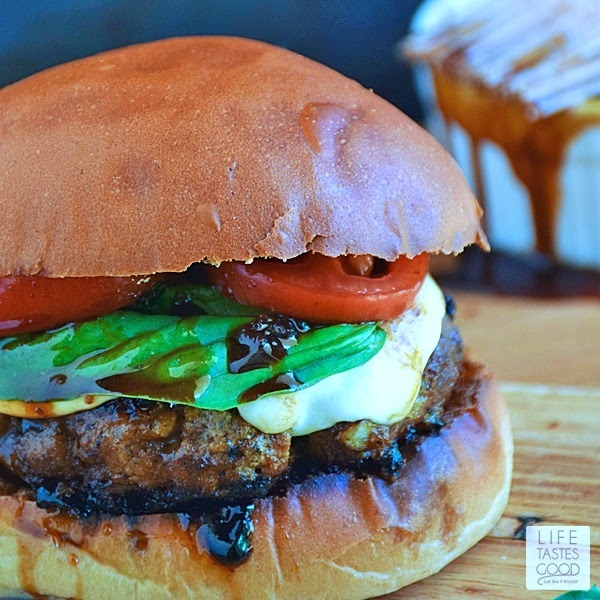 These burgers are made with high quality Certified Angus Beef® ground chuck and basted with an easy-to-make balsamic glaze. By adding fresh toppings of tomatoes, basil, and mozzarella we are maximizing flavor for full-blown burger nirvana! I love, love, love the flavors on this burger. The fresh and classic taste of an Italian Caprese salad fused with an American favorite from the grill is a match made in foodie heaven. You have got to try this burger, y'all! Not only are these juicy burgers delicious, but they are colorful and pretty too. Did you know the simple Italian Caprese salad was made to resemble the Italian flag? The green, white, and red of the fresh basil, mozzarella, and tomatoes match perfectly to the colors of the Italian flag. That's just a little trivia for you in case you're ever on Jeopardy. You're welcome <wink>. Although, all of the flavors in this juicy burger combine to create something amazing, the Certified Angus Beef® is really the star of the show. It's true! The Certified Angus Beef® brand defines the standard by which all beef is measured. The best of the best packed with flavor and always tender and juicy! 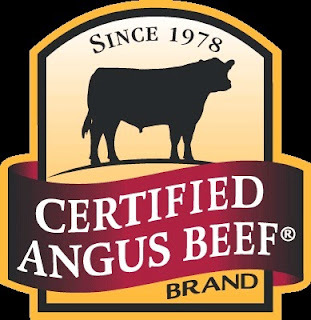 The Certified Angus Beef® brand is the ONLY Angus beef brand that has been around since 1978. It is more selective than USDA Choice and Prime, as each cut must meet TEN (10) exacting standards of quality to earn the title of Certified Angus Beef® brand, thus ensuring the best quality in every cut. Fire up the grill for a mid-high heat. While the grill is heating up make the balsamic glaze per the instructions (click on link above in ingredients list for homemade balsamic glaze). This will take about 15 to 20 minutes. When the glaze is ready it should coat the back of a spoon and taste deliciously sweet and tangy. Set aside until ready to use. While the glaze is simmering, in a bowl combine 1 lb ground chuck, 1/3 cup mushrooms, 1/2 tablespoon garlic, 1/4 cup minced onion, 1 tablespoon chopped parsley, 1/4 cup almond flour, 1 egg, 1 teaspoon kosher salt, and a 1/2 teaspoon pepper. Mix everything until well combined and form into 4 hamburger patties. When the grill is ready, place the patties over mid-high heat and cook, undisturbed for about 5 minutes until the patties have a nice sear on one side. Flip the burgers and cook about 5 minutes again until the 2nd side forms a nice crispy sear. During the last minute or so of cooking I baste each burger with the balsamic glaze and top with a slice of mozzarella cheese. Continue to cook until the cheese melts and the burgers are cooked through. Keep in mind the cook time will vary depending on how thick or thin you formed the patties, so adjust the times as needed. Cook until the juices run clear. 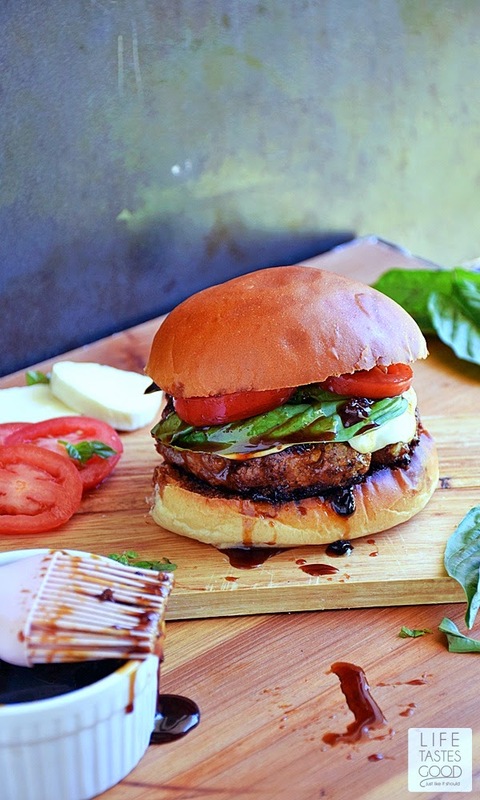 To assemble the burgers, top each bun with a cheeseburger patty and add fresh basil leaves, sliced tomatoes and another drizzle of balsamic dressing. Enjoy! > Join the #SundaySupper conversation on twitter on Sunday! We tweet throughout the day and share recipes from all over the world. Our weekly chat starts at 7:00 pm ET. Follow the #SundaySupper hashtag and remember to include it in your tweets to join in the chat. To get more great Sunday Supper Recipes, visit our website or check out our Pinterest board. Would you like to join the Sunday Supper Movement? It’s easy. You can sign up by clicking here: Sunday Supper Movement. Whoa.... That's one awesome looking burger. What a delectable burger! Love the glaze and all the fixin's!!! I could reach into the screen and grab this it looks so juicy and delicious! Your burger looks fantabulous!! I'm drooling over that sauce, too. Thanks, Christie! I could eat these everyday! You always make the most mouthwatering burgers and this is no exception! I would love to have this on my dinner table! I love that you added mushrooms for a nice balance. Beef goes great with these flavors! Thanks, Cindy! I love mushrooms and pair them with beef all the time! 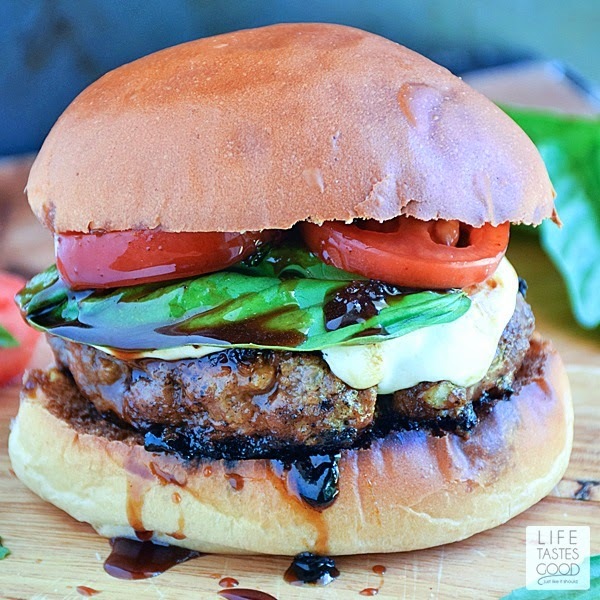 I am in love with the balsamic glaze, and you totally took these burgers to even further heights with all the Italian-inspired flavors! I can't wait to give this a try! Thanks, Sarah! The balsamic glaze pretty much completes me. I love it and put it on everything! I hope you like these as much as we do! Thanks, Dorothy! I am a sucker for fresh basil! Now if I could only get it to grow for me!! Holy cow! I saw this burger on Triberr and my mouth instantly began salivating. I couldn't get here fast enough to see how you cooked it. Love!